I never liked beans as a kid. In fact, that's putting it mildly. I detested beans. In an attempt to get me to eat it, I was told that it'd make me grow taller (who else was fed this line?). I wasn't so convinced - if growing tall meant suffering through mouthfuls of mushy beans then I was more than happy to remain a little shrimp. Still, I had no choice in the matter and over time developed strategies to make it more palatable to my young taste buds e.g. loading up on plantain or a good chunk of bread (both usually served alongside beans, thankfully). 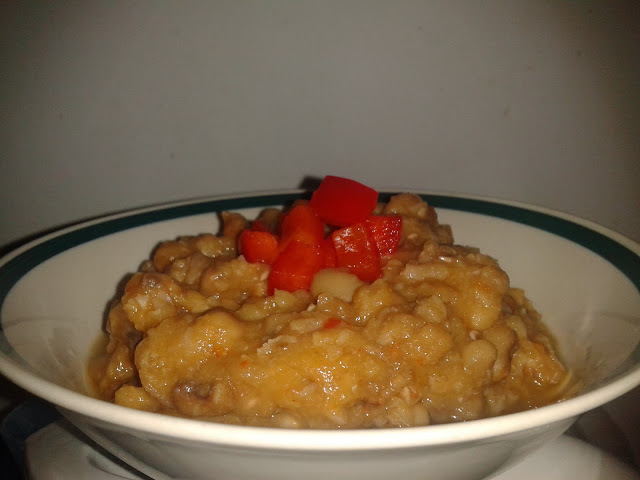 'Ewa' is the Yoruba name for this meal, but utter the word 'beans' (the 's' pronounced instead of the 'z' you have in 'baked beans') and the image conjured up in a Nigerian's mind would most likely be the porridge-like dish made with honey beans (a.k.a. oloyin) and palm oil. This is a leaner version of that. The palm oil has been taken out and replaced with a dash of olive oil and some red pepper mix to give it some colour and added flavour. Still tastes great (there's no hiding the unique taste of honey beans). But if you want to go down the traditional route, go ahead and add some palm oil to yours. Tip: soak the beans overnight and rinse thoroughly before cooking. Start by placing the beans in a large pot and covering completely with water. Boil for 5 minutes and discard the water. Give the beans another rinse. Cover the beans with water again and cook with the diced onion for about 45 minutes (low heat), making sure that the water doesn't dry up completely before the beans turn soft (you may need to add more water as you go along). At the end of the cooking process, you want to be left with very soft beans and a mushy consistency. Add the red pepper mix, a spoonful or two of olive oil and salt to taste. Stir to combine all the ingredients and cook for another 10 minutes. Serve hot with some plantain, bread or a generous sprinkling of garri over the top. 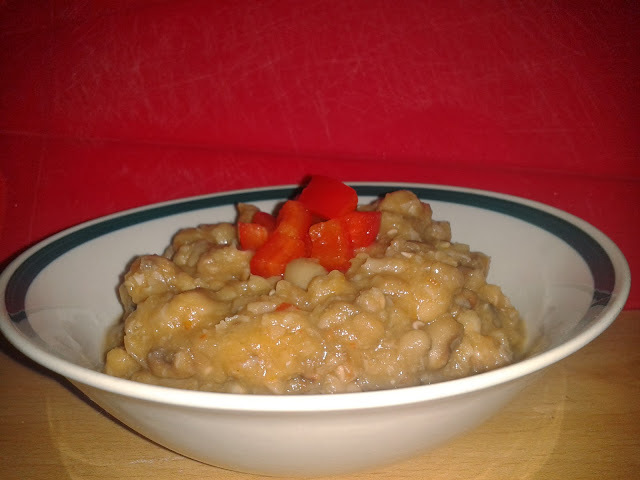 Now, beans and yam...that's the first time I've heard that combo!